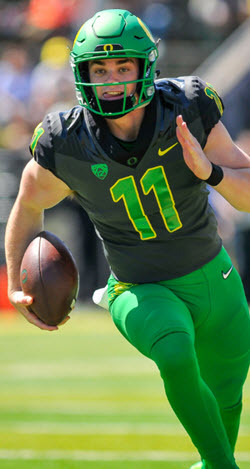 You know how it is; Oregon Spring games are hard to truly gauge for accuracy going forward. I could list a ton of examples from the past, but I’m sure you have experienced frustration and fascination from what has unfolded in the many Spring Games you’ve witnessed in the past. The Oregon Homer within me…. Admit it–most all of us felt that he could never be a Pac-12 quarterback, but his improvement was astonishing to me. He could beat a Bowling Green, but not a Stanford yet in case of injury to you-know-who. But such a jump in his play shouts out to me the confirmation of internal reports that he did not expect to play last year and was truly not ready. With the trend-line he is on … he could come through for the Ducks at a later date, but I have more to discuss later this summer. That name (Tyler Shough, pronounced ‘Shuck’) is going to mess us fans and writers up for a long time, while he is messing up Pac-12 defenses for touchdowns. 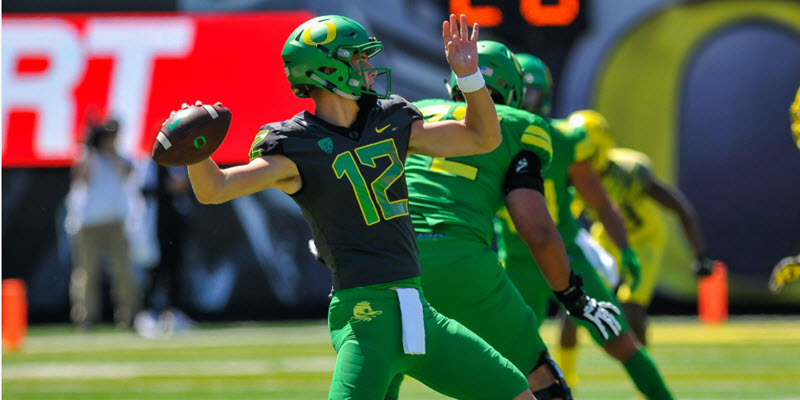 I love the look and the upside of this player; the next Justin Herbert? I was quite worried hearing the starting center Jake Hanson was injured all spring, with back-up Calvin Throckmorton dealing with an injury as well. Yet we had no bad center snaps, and as I’ll show later, some damn good blocking at the center position. The word in spring camp was confirmed as CJ Verdell impressed me with his vision and his understanding of utilizing his low pad level and power for short yardage situations. My Greybeard friends … think Tony Cherry! 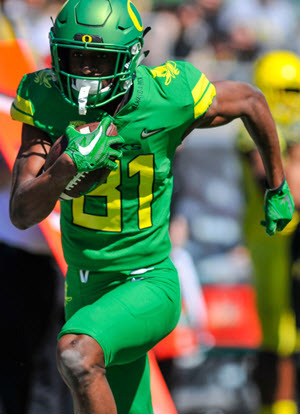 Daewood Davis running for a touchdown in the 2018 Spring Game. Our other receivers simply do not have the “it” factor; they are serviceable. I know … I got a thing for alliteration in subtitles today, but when you spend a bunch of money on your own site for the fun and passion and for fellow Duck fans—you can do these impulsive things. Yup–so was I. In the morning Eugene Register-Guard … I was reading FishDuck.com contributor Coach Ken Woody, and looking over the names on the offensive and defensive lines before the game, and was wincing. Based upon experience of 30+ prior Spring Games? This looked bad for the offense, as there was much more talent on the defensive line in depth than on offense–yet you would not know it from watching the game. This Offense is Offensive to ME…. I am gravely disappointed, concerned and almost in a blind panic at what I saw from a schematic, X&Os point of view. They were not wrong, but philosophically so different…it is more than I can cover here and will go into it deeply on Monday morning. This is not what I was sold on…do any of the Greybeards remember the Craig Fertig fiasco in the 70s at little brother 40 miles away? We could be in big trouble. There is so much to discuss, and on this site we will do so in a civilized way, but we will not refrain from stating our true feelings and thoughts. On Monday morning–you will see an article expanding upon what you see above, and while I could be wrong–it is worth considering.